The main entrance to the campus of the State University of Campinas (Unicamp). Photo: Unicamp/Ascom. A college of Unicamp (State University of Campinas), near the city of São Paulo, in Brazil, is trying to secure the payment of about US$ 1.64 million to Princeton University in the USA. The money would come from a contract with power companies led by AES Tietê, based on the law to support innovation in the energy sector. The law requires the public utility companies to invest in research conducted in Brazil, and its resources can not be used to pay foreign institutions. Depending on the exchange rate since last year, the value to be transferred can reach half of the total of the $ 13.98 million BRL contract between AES Tietê, Unicamp and three national consulting firms. Named by the Smart-Sen acronym, the study plans to develop in three years the technology and a computer system to secure the supply of electricity with the inclusion of wind power, whose behavior is highly unstable. The Princeton University has already developed in the US and other countries similar systems for large power grids. Located in the State of New Jersey, Princeton is one of the most prestigious universities in the world since the beginning of the 20th century. The history of its professors records 21 Nobel Prize winners, and others who had already received it before joining the institution, as physicist Albert Einstein (1879-1955). Without the collaboration of Princeton, Unicamp has no capacity to execute the Smart-Sen, said to the reporter the mastermind of the project, Paulo Sergio Franco Barbosa, engineer, former Dean of FEC (Faculty of Civil Engineering, Architecture and Urbanism). He proposed in September 2015 the contract with public utility companies already predicting the participation and the remuneration of the American university, where he did a postdoctoral research in 1999-2001. In October, at FEC, the Dean Marina de Oliveira Sangoi Ilha was alerted about the Smart-Sen by three professors. In a letter, the professors Andre Munhoz Argollo Ferrão, Antonio Carlos Zuffo and Vinicius Fernando Arcaro pointed out the constraints of the electricity sector incentive policies for foreign institutions. Despite the warning, the proposal was approved in the same month by the council of the school. The draft contract approved by the college provided 36 monthly installments of $ 133,333.33 BRL, to be paid by AES Tietê to Princeton. The total amount of $ 4.8 million BRL corresponded to about US$ 1.23 million in the previous month, when the project was written by Barbosa. At the end of the year, the American university ended up getting out of the contract when the AES Tietê registered the contract with Aneel (National Electric Energy Agency), which oversees the projects of law 9.991/2000. 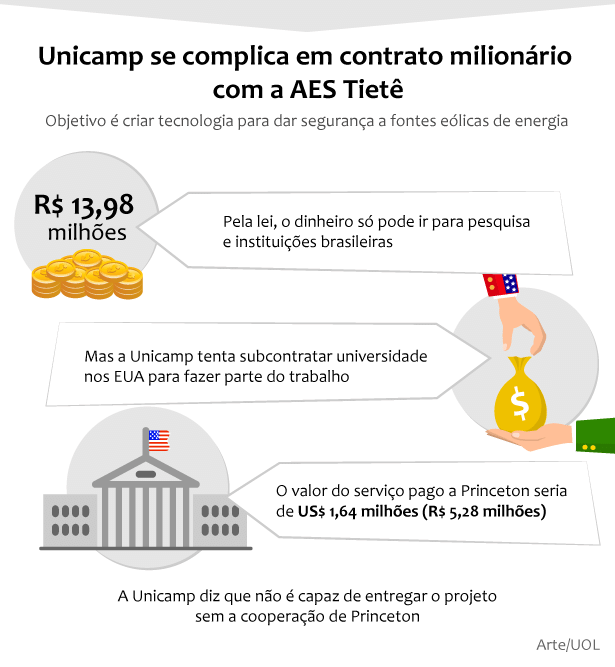 Translation: Unicamp in hot water with a millionaire contract with AES Tietê./ Goal is to create technology to secure the wind energy sources./ US$ 4.3 million – By law, the money can only go to research and Brazilian institutions./ Unicamp tries to subcontract Princeton University./ The value to be paid to Princeton is US$ 1.64 million./ Unicamp says it is not capable of delivering the project without the cooperation of Princeton University. Trying another means to pay Princeton, Barbosa proposed in May this year to the Department of Water Resources an agreement directly with the American university. This time, besides being proposed in dollars, the expected value was 33% higher than the previous value, US$ 1,639,121.92 “limited to $ 6,556,487.68 BRL”. This “limit” refers to the price of $ 4 BRL per dollar, the highest level reached by the US currency in Brazil, which took place in January and February of this year. The exchange rate calculation refers to the beginning of the contract with AES Tietê, which did not include Princeton as intended to the original proposal. The source of these funds, under the new proposal, is the same contract of Unicamp with AES Tietê for the Smart-Sen, with funds obtained based on the same incentive policy. Also according to Barbosa, besides the help from Funcamp (Foundation for the Development of Unicamp) and the university Innovation Agency, the draft for the agreement would have been written with the help of representatives from the “legal department of Princeton”. Amid the difficulties arising from having generated two administrative procedures for the single research project, which is the Smart-Sen, Barbosa used a subtlety that ended up compromising their proposal. In its request, it refers to the study in the contract with AES Tietê as “same project title, approved in all instances of Unicamp” in 2015, which substantiated the contract with AES Tietê. The Barbosa’s request was also approved in May by the council of the Department of Water Resources. Signed by Professor and Head Paulo Vatavuk, the council’s opinion in a single page, reiterated without clarification, that the proposed amount was one-third higher than predicted in the initial project. In July, also under the chair of the FEC’s Dean, the council of the college, which in October was favorable to the “other” Smart-Sen, voted to approve the agreement proposal. The reporter sent questions to the Smart-Sen coordinator by e-mail since August 31, and was received by him for an interview recorded on 14 at the Press Office of Unicamp. The Professor was asked about the restrictions of the law of the electricity sector incentives. He was also questioned about the ANEEL guidelines that specify: “The participation of foreign researchers, if any, should be through direct contracting by the national executing agencies, being mandatory the execution of the project activities in Brazil“. In response, Barbosa said that he would have been advised to disregard this Aneel guideline, at a meeting with representatives of the agency. He ascribes this advice to the Superintendent of Research and Development and Energy Efficiency, engineer Maximo Luiz Pompermayer. Questioned by his corporate e-mail and through the press office of Aneel, Pompermayer did not comment on the alleged advice of not to consider the Aneel guideline mentioned above, ascribed to him by Barbosa. The agency also did not comment on this issue. Questioned about the legality of the attempt by the Smart-Sen coordinator, with support from his college, to pay Princeton with funds from the contract of Unicamp with AES Tietê, Aneel said in a statement that in their records of the project “there is no foreign executing entity, not characterizing the raised irregularity“, but that there are penalties provided for in case of any irregularity found. Aneel also said in a statement that the existence of cooperation or agreement between Brazilian and foreign universities for exchange of knowledge and professionals, is not regulated by the research and development program of the agency. And the participation of some foreign researcher, as part of a cooperation agreement or contract is not prohibited or discarded, when according the regulations. Based on this clarification, the reporter pointed out the fact that the Smart-Sen research project prepared by Professor Barbosa unequivocally provides for the Princeton University as executing agency and conducting research in the United States. In addition, the contract proposal submitted last year and the agreement submitted this year, identify as source of funds, the research project funded by AES Tietê under the supervision of Aneel. Moreover, the remuneration provided for Princeton, both in the current contract ($ 4.8 million BRL), as in the proposed agreement ($ 6.56 million BRL), are much greater than the value established for Unicamp specifically for research ($ 2 million BRL). Aneel did not comment on these considerations of the report, which characterize Princeton University as executing entity. Despite the requests since August 31, AES Tietê did not inform the values already transferred through the Smart-Sen contract. The company said it was up to Aneel to inform this data, but the regulatory agency also did not provide the values. In addition to the $ 4.8 million BRL originally planned for Princeton and about $ 2 million BRL for research at Unicamp, there were values defined for the consulting firms Venidera Pesquisa e Desenvolvimento ($ 1.16 million BRL), Cortes Assessoria e Consultoria ($ 939,600 BRL), Sinerconsult Consultoria e Participações ($ 550,800 BRL) and $ 995,000 BRL for travel and fees. The total sum of these values is approximately $ 10.5 million BRL. However, AES Tietê also provides approximately $ 3.49 million BRL more for “exchange rate variation” and operating expenses of the power public utility companies participating in the project, totaling $ 13,983,841.64 BRL displayed in the Aneel spreadsheet of April 29 this year. “The participation of researchers from Princeton University has been formulated since the beginning of the project design with the knowledge of Aneel. The institutions are nationals, as required by law 9.991/2000: Unicamp and AES Tietê. The research agreement with Princeton University was established between the American institution and Unicamp and not with AES Tietê. There is no legal impediment on this form of partnership between universities, according to Aneel”, the power company stated. The reporter questioned the CEO of AES Tietê, engineer Ítalo Tadeu de Carvalho Freitas Filho, about possible conflict of interest that could have interfered in decisions such as the acceptance of the Smart-Sen. The question was due to the fact that the head of the company had Professor Paulo Sergio Franco Barbosa as his master degree advisor. His masters defense committee had Professor Alberto Luiz Francato, another participant of the Smart-Sen, and engineer Fernando Amaral de Almeida Prado Júnior, partner of Sinnerconsult Consultoria e Participações, one of the consulting firms contracted. Neither the president of AES Tietê nor the public utility company manifested about these questions repeatedly made since 31 August by the reporter, which was available to appreciate considerations about this and any other issues that the leader and the company wanted to present. The president of AES Tietê had been questioned previously about possible conflict of interest in the report of Direto da Ciencia published in August, “Money for University of Campinas Research was Paid to Professors’ Company”, which revealed another project of Professors Barbosa and Francato contracted with the public utility company. Questioned about AES Tietê’s assertion that the agreement with Princeton was approved by both universities, Unicamp said in a statement that the proposals on the Smart-Sen project were approved in the aspect of academic merit, but are still in the analysis of its legal aspects. Unicamp also said that the University Council, the highest administrative body of the institution, did not appraise the Smart-Sen. However, the University Council has already approved with retroactive effect, and after more than a year, other projects proposed by professors Barbosa and Francato, including the one quoted in the report that mentions payment by AES Tietê to the company of the two professors. Unicamp also said that no value of the contract with AES Tietê for the Smart-Sen project was transferred to Princeton. Questioned by email since 20, the consulting firms (Venidera Pesquisa e Desenvolvimento, Cortes Assessoria e Consultoria and Sinerconsult Consultoria e Participacoes) did not comment about their names being mentioned in this report on the Smart-Sen project, for which they were contracted by AES Tietê. Marina Sangoi de Oliveira Ilha, Dean of the College, Paulo Vatavuk, Head of Department, and Alberto Luiz Francato, Vice-Dean of the College, did not respond to questions sent by the reporter, especially on their role in the approval of the Smart-Sen project proposals. 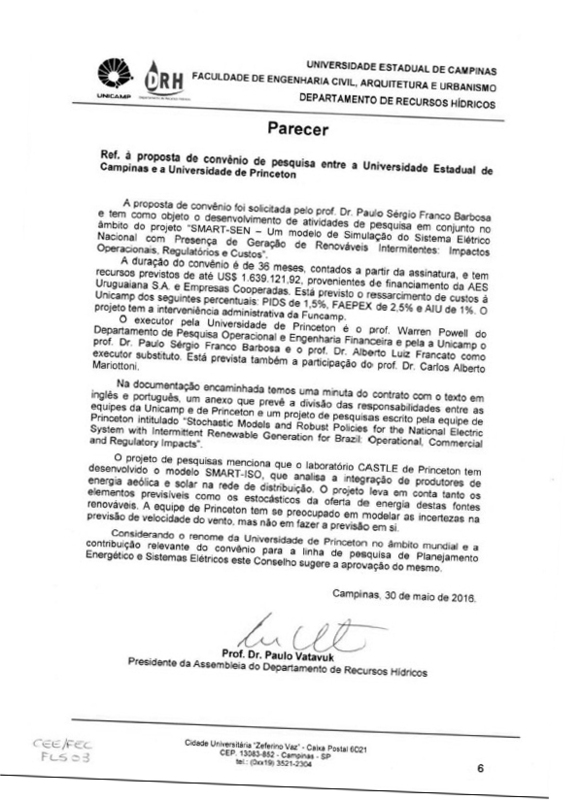 Professors Andre Munhoz Argollo Ferrão, Antonio Carlos Zuffo and Vinicius Fernando Arcaro, of the same college, did not want to comment on their questioning to several instances of Unicamp on the legality of the Smart-Sen, claiming that this and other projects are being investigated by the university and by the Public Prosecution. Professor Warren Powell, from Princeton University, stressed the importance of Smart-Sen for the efficiency and safety of the Brazilian electrical system. He also said that the agreement with Unicamp has not yet been approved by the two institutions. He refused to comment on the legal aspects of the project. Questioned by the reporter, the Princeton University did not comment about the Smart-Sen, including Professor Paulo Barbosa’s statement that the agreement proposal had collaboration of its legal department.